When biodegradable microparticles were injected into the blood stream following a heart attack, the size of the heart lesion was reduced by 50 percent and the heart could pump significantly more blood. After a heart attack, much of the damage to the heart muscle is caused by inflammatory cells that rush to the scene of the oxygen-starved tissue. But that inflammatory damage is slashed in half when microparticles are injected into the blood stream within 24 hours of the attack, according to new preclinical research from Northwestern Medicine and the University of Sydney in Australia. The micoparticles work by binding to the damaging cells – inflammatory monocytes – and diverting them to a fatal detour. 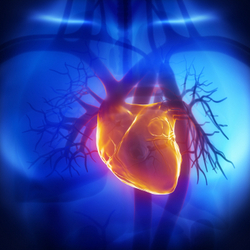 Instead of racing to the heart, the cells head to the spleen and die. The particles are made of poly (lactic-co-glycolic) acid, a biocompatible and biodegradable substance already approved by the Food and Drug Administration for use in re-absorbable sutures. A microparticle is 500 nanometers, which is 1/200th the size of a hair. The scientists’ study showed that the microparticles reduced damage and repaired tissue in many other inflammatory diseases. These include models of West Nile virus, colitis, inflammatory bowel disease, multiple sclerosis, peritonitis and a model that mimics blood flow after a kidney transplant. Getts, Miller and Nicholas King, professor of Viral Immunopathology at the University of Sydney School of Medical Sciences, are corresponding authors on the paper, which was published January 15 in Science Translational Medicine. The research was supported by grants NS-026543 from the National Institute of Neurological Diseases and Stroke and EB-013198 from the National Institute of Biomedical Imaging and Bioengineering of the National Institutes of Health, and the National Health and Medical Research Council in Australia. Editors note: King, Getts and Miller have an interest in Cour Pharmaceutical Development Co. Getts is the chief scientific officer.